PetroChina's market cap hit $1 trillion in 2007 after a successful debut on the Shanghai Stock Exchange on Nov. 5 of that year. It was all downhill from there, however, as oil prices collapsed and a global financial crisis broke out. PetroChina's market value plummeted to less than $260 billion by the end of 2008, representing the largest destruction of shareholder wealth in world history, according to Bloomberg. A driver fills his car at a PetroChina gas station in Guangzhou, China. Before Apple hit $1 trillion in market value Thursday, there was Chinese oil giant PetroChina, which reached the milestone more than a decade ago. It did not fare too well after that. The rise gave the company a market cap of $1.1 trillion on both the Shanghai and Hong Kong exchanges. According to Reuters, PetroChina's opening price in Shanghai valued the company at 60 times analysts' forecasts for its 2007 earnings per share, above the global average of 18 times for oil company's at the time. It was all downhill from there, however. PetroChina's market value plummeted to less than $260 billion by the end of 2008, representing the largest destruction of shareholder wealth in world history, according to Bloomberg. Blame the financial crisis and a collapse in oil prices. When PetroChina made its debut in 2007 brent crude prices were at one point, above $140 a barrel. Today they are about half that. PetroChina has not fared too well since the end of 2008, either. 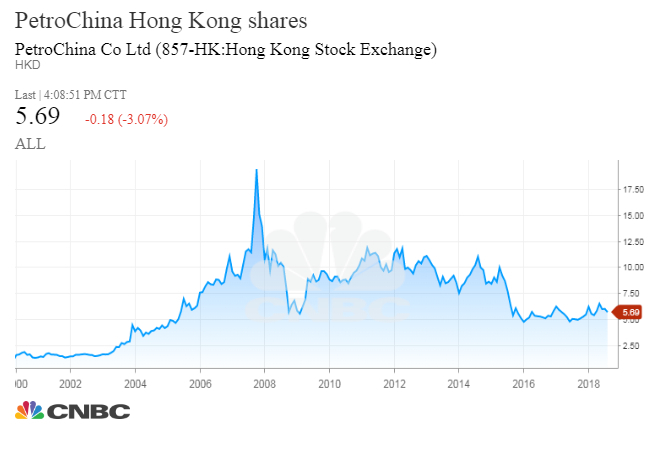 The company's Hong Kong-listed stock is down more than 20 percent since the start of 2009. Apple closed 2.9 percent higher at $207.39 a share on Thursday, pushing its market cap to $1 trillion and making it the first U.S. publicly traded company to reach the mark.